Manila, Philippines - The Department of Science and Technology (DOST) through the Science Education Institute (SEI) released today, March 4, 2014 the official results of AY 2014-2015 scholarship exam. The names of the scholarship qualifiers or list of passers out of the 35,562 qualified graduating high school students who took the exam in September 2013 are now available online. A total of 3,982 high school students qualified to the Science Scholarship Examination, up by 10.7% from last year. From the total number of the 2014 passers, 3,473 who belong to economically disadvantaged families qualified under the RA 7687 Scholarship grants, while 509 students who topped the examination qualified under the DOST-SEI Merit Scholarship Program. Meanwhile, 500 second year college students who are enrolled in DOST-SEI identified institutions under its priority courses have qualified for the S&T Scholarships for Sophomore College Students. Of this number, 271 are grouped under the RA 7687 scholarship program and 229 under the Merit scholarship. Qualifiers will get to avail of and enjoy the scholarship privileges effective the Second Semester of AY 2013-2014. SEI’s Supervising Undersecretary, Prof. Fortunato T. De La Peña said he is hopeful that the increased number of passers would ultimately translate to an increased number of graduates that will pursue S&T careers in the future. “The goal is to produce quality science professionals and we really hope that the same number of passers would become scientists and engineers who will be willing to work in the country in the near future,” he said. The complete list of passers includes new scholars for RA 7687, MERIT, GREAT-M, SOPHOMORE (RA 7687 and SOPHOMORE (Merit). The new scholarship awardees must seek admission in any of the priority S&T fields of study at state colleges and universities and CHED-identified Centers of Excellence/Centers of Development. Each qualifier shall receive a notice of award from the DOST-SEI or DOST Regional Office stating the date of orientation and contract signing. He/she shall report at the designated venue with a parent/legal guardian who must bring a 2014 Community Tax Certificate or Official Passport. The legal guardian is required to present his/her affidavit of guardianship, DOST said. The names of some potential qualifiers are put on hold pending re-evaluation of some requirements. 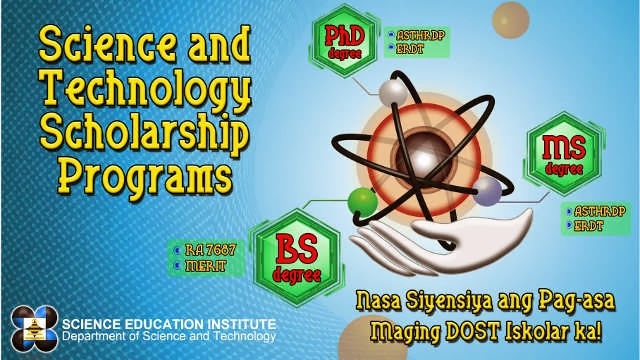 The following are the qualifiers of the DOST-SEI Scholarship Programs (also available at www.sei.dost.gov.ph and www.science-scholarships.ph). ALMERO , EMERSON ORTILE JR.
DELOS SANTOS, JESUS DIERRA JR.
EBRADO, NICOLE DAVE GENOBIAGON JR.
ENMIL, ROLANDO MANUEL PINAPIN JR.
ESLABRA, GERARDO DE MESA JR.
RUIZ , MAGALLANES HOSMILLO JR.
BAGTAS, GERRY DELA CRUZ JR.
BALUYOT , BERNARD KARGANILLA JR.
ARREZA , JONATHAN GILLES JR.